Mike plays ukulele with the Pangean Orchestra. He came to the ukulele via a circuitous route, over the course of many years. Ukulele represents the intersection of Mike’s interests in music and exploration. Mike began learning guitar in the days when it was typical that kids could read music by sixth grade. He even took his first lessons as Frank Zappa’s second solo album, “Hot Rats,” was being recorded. After an unsuccessful foray into basement rock, Mike put down the guitar for many years. He didn’t pick up a guitar again until after a trip to Hawai’i. There, he found the style of slack key guitar. Exploring slack key guitar led to revealing Hawaiian music as a source. Within Hawaiian music, ukulele is a harmonious rhythm instrument. 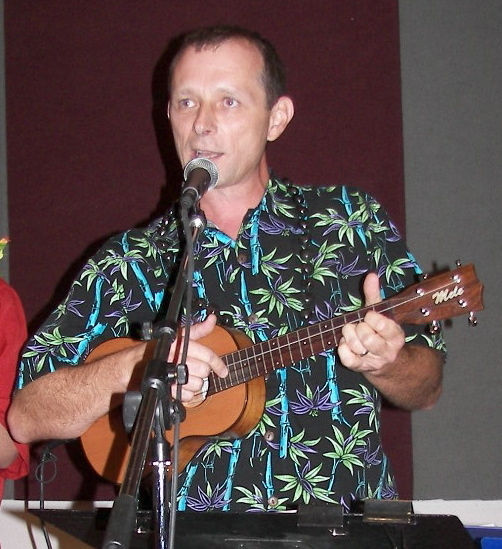 Conveniently, the ukulele is also easy to play and easy to carry, so ukulele is now one of Mike’s routes for connecting to Hawaiian culture. Mike learned ukulele from Kumalae Matthews, Mike Nakabayashi, Chad Pang, Walter Kawaiaea, Kimo Hussey and others. From those sources he taught in the Phoenix area; the teaching experience led to maintaining a web site of reference material (http://mikebonnice.com). He currently performs in hula events and shows with Kaimikahu Hale O Hula. He manages the portion of Arizona Aloha Festival associated with experiencing Polynesian music through participation.